If you missed our youth-led worship last weekend, you missed a wonderful Spirit-filled time of worship as the Easter season came to a close. Our youth are not the future of the church – they are an active and blessed part of the church alive in the world today. Today is one of the great festival days of the church – Pentecost. It’s kind of like the birthday of the church because this is the day that the church celebrates the gift of the Holy Spirit. A gift that comes 50 days after celebrating the resurrection of Jesus. A gift that continues to come as the Spirit blows in so many amazing and life-giving ways through each one of us. A couple weeks ago I shared in another sermon that this section of John’s gospel is known as Jesus’ Farewell Discourse. It encompasses chapters 14–17 of this gospel. In these chapters Jesus is preparing his disciples for what is about to come – namely the events of Holy Week and the crucifixion. He is also preparing them for their ministry and mission in the world beyond the time that Jesus is able to be physically present with them. In today’s gospel reading, he is sharing with them that the Father is going to provide an Advocate for them. An Advocate that comes in our reading today from the book of Acts with tongues of fire and languages from every nation under heaven being spoken at the same time. An Advocate, as Jesus says, that is one who will testify on Jesus’ behalf. An Advocate that challenges those of us who claim to be followers of this Jesus still today to also testify on behalf of Jesus. An Advocate that gives us hope in this work that we are called to do as children of God. But, the obvious question for Lutheran Christians with all of this is “What does this mean?” And Pentecost and the breath of the Spirit and all this talk about an Advocate gives us pause to ask that question again and again to find meaning in the movement of the Spirit right now, right where we are. Yes, as one of our preachers last weekend reminded me, cookies and coffee are one of the blessed parts of a pastor’s work and life. But the last 7 days in my life as a pastor have existed around an over-abundance of meetings, pastoral care and visitation appointments, presiding and preaching at 3 funerals, and way too many phone calls and emails to possibly begin to return within the framework of a 24-hour day. It was also a week when Jesus words in today’s gospel spoke deeply to this journey. A journey with Jesus reminding me several times each day that I have an Advocate – the Holy Spirit – walking alongside me. The Advocate, who gave me peace and hope and endurance each day this week. In just the last 7 days of my life as a pastor, God has provided hundreds of opportunities to witness the vision and hope of a community made possible ONLY through the work of the Spirit. The work of the Spirit in the care and concern we share as we gather together as brothers and sisters in Christ in order to help families grieve and heal following the death of loved ones. The work of the Spirit as Good Shepherd serves alongside a Leadership Class with the Bismarck-Mandan Chamber of Commerce to increase the number of locations offering Little Free Pantries for brothers and sisters in need in our community. The work of the Spirit that is always a work of peace in spite of violence and evil that continue to ravage the communities and nations in which we live. The work of the Spirit as church school children and adult leaders celebrate the end of a church school year, by creating amazing pieces of Pentecost artwork that adorn our worship spaces this week. Wendy and I recently attended the annual Senior Pastor’s conference. This is an event that gathers together Senior Pastors and their spouses from the largest congregations in the Evangelical Lutheran Church in America. It’s a few days of learning, networking, rest, and relationship building with other pastors who serve congregations like Good Shepherd across this church. To be honest – it’s among the most important few days of the year for Wendy and me. So, by now you might be wondering why I have a South Carolina license plate on the screens this weekend. Well, first, the Senior Pastor’s conference was in South Carolina this year. 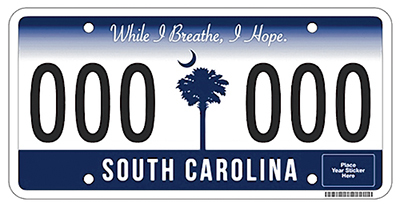 And, second, believe it or not, the tag line on the South Carolina license plate of our rental car reminded me of the work of the Spirit. If I wasn’t open to it, I probably would have missed it. Which is something that, unfortunately, happens more often than I care to publicly admit. Brothers and sisters in Christ, the Spirit is still breathing. Jesus has a lot more to say to us. God has more to do through us. And the breath of the Holy Spirit that’s already been given to us and is living in you and me will guide us and be our Advocate along the way. You are deeply blessed along this journey. Blessed and sent into the world once again this week with a vision and a hope. A vision and a hope that is radical and shocking and surprising – even for those who already follow Jesus like you and me. A vision and a hope that will bless you and those God places before you in ways that are only possible because of the work of the Spirit. The Spirit is at work, brothers and sisters. Thanks be to God that it is. Amen. Not to be deterred, with a tool-belt around his waist and an unrealistic goal in sight, the confident dad began to assemble the tree house. 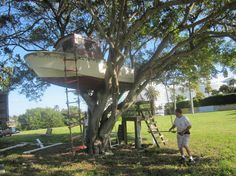 He spread all the parts across the backyard and began to read the instructions, soon to realize that the parts and instructions were not for a tree house, but for a sailboat! His confidence gone and the tool-belt lying in a dark corner of the garage once again, the now frustrated and slightly angry dad quickly sent an email to the company complaining about his order. Jesus says to us in today’s gospel reading, “Abide in me as I abide in you.” You and I cannot live our lives in Christ and bear good fruit in the world apart from Christ, any more than a backyard tree house can make a good sailboat on a lake. Our gospel reading today reminds us that our identity in every way begins, and ends, as we are connected to the vine. A vine which is Christ abiding in us. A vine that is possible because God, the vine-grower, makes it possible in the first place. Occasionally when I read and study scripture, I get stuck on a word or phrase. I hear it a little differently than I’ve heard it before. It’s really one of the main reasons why I believe we call scripture the Living Word. Scripture is constantly meeting us where we are. Transforming us and making us new every time we receive it. God abides in us. Jesus abides in us. Scripture abides in us. We abide in God. And we abide in each other. If you haven’t figured it out yet, the word that stuck with me this week was the word abide. I’m guessing that the word abide is not a regular part of your conversation or vocabulary. To be honest, I can’t recall the last time I actually used the word abide in any conversations I’ve had or written communication I’ve shared. Abide, as defined by dictionary.com, means “to remain; continue; stay:”; “to be able to live with, or stand.” The important part of the word abide to take note of is that it is a verb. It is not passive, but active. And it always requires a relationship. So when Jesus says, “Abide in me as I abide in you.”, this mutual abiding is not something that we can do independent of anyone or any other part of God’s good creation. Like it or not, as children of God – children of God who are created in the image of the vine-grower – we are connected to each other. Abiding in each other. This section of the gospel of Saint John is known as Jesus’ farewell discourse. It begins in chapter 14 right after the disciples have celebrated what we now know as The Last Supper and concludes in chapter 17 with Jesus praying for his disciples. Which leads directly to the time of the crucifixion. Jesus is trying to prepare his disciples for what’s about to happen. He is also trying to assure them that he will be with them always – even when life gets hard. And we all know because of the experiences we walk through each year in Holy Week, it’s about to get really hard for the disciples. I want to also note that John’s gospel is written for a community that has likely been thrown out, rejected their by friends and family, and probably feeling pretty isolated and alone. They are probably feeling like they have been cut down, not simply pruned. There are dozens of times when the word abide is used in Holy Scripture. In every single verse where the word abide is used, it is used in ways that speak about relationship. Relationship with other people. Relationship with creation. Relationship with God. There are times in our own relationships when we might feel like the people who are first hearing these words from John. When we feel left out, alone, even abandoned. It’s precisely in those times that we need to hear Jesus say to us again, “Abide in me as I abide in you.” It’s a reminder that we are never alone because of the relationship we have with God through Jesus. And there will be times in all of our relationships when a little pruning needs to be done. Pruning not to disconnect or destroy or cut down, but pruning in order for good fruit to come forth. Pruning that happens – or maybe needs to happen in spite of our opposition to it – from time to time. Pruning that will result in much fruit being produced and God being glorified. One of the central purposes for John’s gospel is to show this early community of Jesus followers who have been shunned and thrown out from the lives in which they have always lived is that, even as they feel shunned and cut off from the community they’ve always known, they are now called to witness to the presence of the Word in the world even after Jesus has returned to the father. They are called to witness to the fact that this Word – this Jesus – abides in them as they abide in him. Always. Forever. One of the ways that we show each other in worship each week that we abide in God and God abides in us is through the sharing of the peace. “Within reach of every hand” as Mother Teresa reminded us, we abide with one another in the peace and love of the risen savior Jesus the Christ. And so as we abide with one another today, I invite you to stand as you are able. Please take a moment to share the fruit of our branches as we share the peace of Christ with one another. A sign of peace and love that is a sign of our abiding in one another as brothers and sisters in the one body of Christ. May the peace of our risen Lord and Savior Jesus Christ be with you all. And also with you.